When you think of Melbourne’s golden era under Norm Smith from 1954-64, there are several players whose names come immediately to mind: Ron Barassi, Frank Adams, Brian Dixon, etc. The name Peter Marquis is not quite so familiar, and yet no man played a more important role in one of the greatest football sides ever assembled. Marquis was born in 1932 and began playing senior football for Devonport in the NWFU in 1950, initially as a forward. It didn’t take long for him to make an impact at the club. In his second season in 1951 he won Devonport’s Best and Fairest award, both NWFU and state representative selection, and was labelled “one of the most promising utility players in the state.” His exploits did not go unnoticed, with VFL club Melbourne making overtures to Devonport in an attempt to gain his services, however Marquis did as expected and remained on the north-west coast for another season, again winning NWFU representative honours in 1952. It was then that Melbourne finally got their man, with 21-year-old Marquis heading across Bass Strait to join the Demons for the start of the 1953 season. It was Norm Smith’s second year as Melbourne coach after crossing from Fitzroy, and the future master coach was yet to weave his magic with his former club. In Marquis’ first season the Demons won just three and drew one of their 18 matches, finishing second from bottom on the ladder. However, Marquis himself settled easily into VFL football, playing all but one match. The next season marked the start of Melbourne’s famous period of dominance, with the Demons making the first of their seven consecutive grand final appearances between 1954 and 1960. That year the Dees were unsuccessful, going down to Footscray in what remains to this day the Bulldogs’ only premiership. Unfortunately Marquis did not take part, missing the match through injury. Twelve months later Melbourne again found themselves playing the biggest match of the year, and this time Marquis was on the field. He had well and truly established himself at full back over the course of the season and performed well on the day as Melbourne overcame Collingwood and their own inaccuracy to win the flag by 28 points. Marquis continued to play a key role at full back over the following three seasons for Melbourne as the Dees won another two back-to-back premierships in 1956-57, before falling to Collingwood in 1958 in one of the all-time great grand final upsets. During that time Marquis was often tasked with quelling the opposition’s best forward, battling star spearheads of the day such as St. Kilda’s Bill Young and Footscray’s Jack Collins. He was ideally suited to the position, able to use his 183cm, 89kg frame and great strength – attributes that would eventually lend Tasmanian commentator and good friend Harold ‘Nunky’ Ayres to bequeath him the nickname ‘Trunky’ – to his advantage. In addition to his multiple grand final appearances he also performed well enough to earn state selection for Victoria. 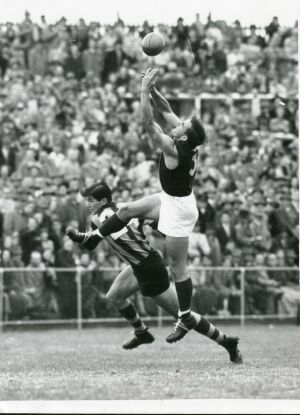 The 1958 grand final defeat was Marquis’ ninety-ninth and final match with Melbourne, the now 26-year-old subsequently returning to Tasmania to play with North Hobart in the TANFL. After an outstanding first season Marquis was named vice-captain in 1960, and captain outright in 1961. Under his leadership North Hobart enjoyed a great period of success, winning back-to-back TANFL and state premierships in 1961-62. Marquis himself enjoyed a great deal of individual success during this period, winning the Weller Arnold Medal as the best TANFL representative player in 1961 and finishing runner-up in the William Leitch Medal count on three separate occasions between 1959 and 1964, as well as representing his birth state on a further five occasions. Despite the success he achieved during his 94 games with the club, Marquis’ time at North Hobart ended on a sour note when in 1964 he sensationally quit the club over a disagreement with the match committee, bringing about a sudden ending to his illustrious playing career. He retired with a tally of 246 senior games, seven premierships and numerous state and league representative honours, and a name as one of the finest players ever produced by the state. Marquis’ contribution to Tasmanian football was recognised with his induction into the Tasmanian Football Hall of Fame in 2005, and inclusion in North Hobart’s ‘Team of the Century’ a few years earlier. Peter Marquis passed away in Hobart in 2005 at the age of 72.